Shyness can be an isolating trait. It can cause people to feel like there’s something uniquely wrong with them while everybody else has it all together. But in reality, shyness is incredibly common: nearly half of all adults identify as being shy. If you’re among them, knowing you’re not alone in feeling shy may provide some comfort. But it certainly doesn’t eliminate some of the negative side effects, which can feel painfully obvious when it comes to the workplace. 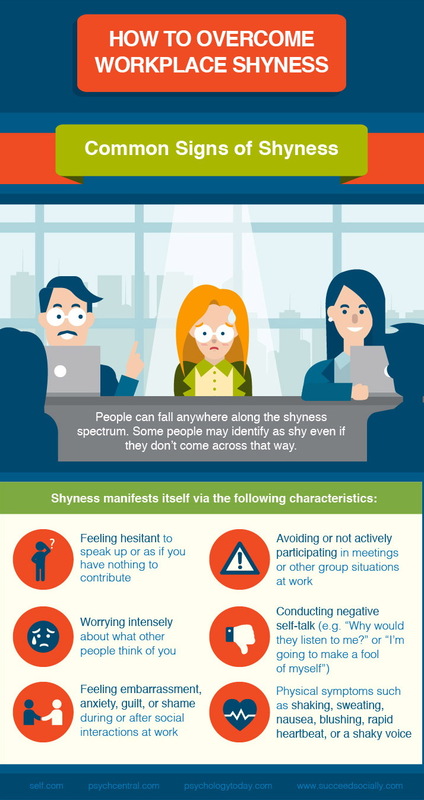 Psychologists agree that shyness can inhibit a person’s ability to present their best self while interviewing, networking, or participating in group meetings or water cooler talk. This probably explains why studies have shown shy people are more likely to be underemployed and less likely to advance in their careers. But here’s the hopeful news: you’re not a victim of your shyness, and there are plenty of strategies you can employ to grow your confidence and assertiveness at work. In the process, you can help ensure you’re recognized for your contributions and are empowered to advance your career however you see fit (And if you’re not shy yourself but know a coworker or employee who is, we’ve got some tips for you, too). Many people confuse shyness with introversion. But while introverts can certainly be shy, the two terms don’t actually mean the same thing. Introverts often feel drained after social interactions and need alone time in order to recharge, but that doesn’t mean they experience the anxiety that’s typical of shy people. Some shy people may also have social anxiety disorder, which is characterized by an extreme fear of judgment or humiliation and a sense of powerlessness or shame in social situations. Social anxiety can be so debilitating that it interferes with a person’s ability to live their daily life or form meaningful relationships. If you suspect you suffer from social anxiety, it’s a good idea to speak with a mental health professional. But if you’re struggling with everyday shyness, you may be able to figure out how to cope with it on your own (more on that below). Want to learn how to cope with shyness? Make a habit of any or all of the following strategies. If you struggle with negative self-talk, it can be easy to get so absorbed in what’s going on in your own head that it consumes or dominates your interactions. The next time you talk to a coworker or sit in a meeting, try to shift your focus outward – really listen to what other people are saying, ask follow-up questions, and pay attention to the group’s dynamics. Getting out of your own head will help you make connections with your team members and stay present with the task at hand instead of getting carried away by anxiety. Research suggests facing your fears is one of the best ways to shrink them while avoiding the thing(s) you’re afraid of will only increase that fear. Avoidance can also get in the way of job advancement. For example, if you never get over your fear of speaking up, then you’re less likely to be considered for a management role. Try to ease yourself into feeling less shy by assigning yourself one goal each day, such as, “Today I will contribute one new idea during the brainstorming session.” Then, for those 90 seconds, or however long it takes to share your idea, pretend you are a confident and assertive person. By taking small steps, you’ll gradually build confidence so you’re able to tackle bigger goals. Soon enough, you may find you aren’t even faking your confidence. It can also be helpful to take an acting or improv class; doing so can provide you with a safe environment in which to practice using your voice in front of others and speaking up even if you feel uncomfortable. Preparation can take several forms. If you’re worrying about a meeting, spend some time preparing a list of ways you can contribute to the topics laid out on the agenda. If you’re fretting about water cooler talk, browse the day’s news headlines before heading into work so you know you can initiate conversation. If you’re anxious about a presentation, conduct a dress rehearsal at home or in front of friends in the days leading up to the actual event. No matter the context, feeling prepared for what’s ahead breeds confidence. This can be easier said than done, but replacing negative self-talk with positive self-talk is a surefire way to reduce social anxiety. The next time you find yourself thinking, “There’s no way I have something valuable to add to this conversation,” try replacing that thought with something affirming such as, “Like everyone else, I have a unique perspective to share.” Try to notice when you talk down to yourself and meet those criticisms with affirmations. Make it a habit and you’ll see your self-confidence grow. Eye contact demonstrates you’re engaged in the interaction and conveys confidence and respect for the other person (or people) involved. As such, it’s a great way to establish a connection with coworkers. Just be sure not to be too intense about it – prolonged, unwavering eye contact can make people uncomfortable. Getting to know your coworkers in a more personal way can help you feel more comfortable interacting with them in a professional setting. Try inviting coworkers out for lunch or coffee. (Start with a one-on-one if you don’t feel comfortable in large groups.) Or join a workplace club or committee. Get to know your coworkers as people, and you’ll realize they’re not as intimidating as you first thought – they’re human just like you. Who knows? You may even make some new friends. When we feel anxious, it tends to be reflected in our bodies – we breathe faster, our heart rate speeds up, we feel lightheaded, and we may experience tension in our muscles. Controlling your breath can help relieve these symptoms so your anxiety doesn’t keep building on itself. Regularly practicing meditation, yoga, progressive muscle relaxation, and/or other breathing exercises can provide you with tools that help you regulate social anxiety whenever and wherever it arises. If you’re the employer or coworker of a shy person, then you’ll do them a huge favor – and help the workplace benefit from his or her insights – by creating an environment where they feel safe sharing ideas. Here are several strategies you can employ to help a shy team member feel more comfortable contributing to the workplace. Many shy people don’t perform their best when they’re put on the spot; they need time to think over their ideas before sharing them. This means surprise visits to their cubicle may not be the most effective way to request their input. Instead, make sure employees know they’re welcome to communicate via various media including email, IM, or an anonymous suggestion box. Letting shy workers share ideas at their own pace helps ensure they can bring their best work to the table. If you know a team member feels uncomfortable speaking up in meetings, create room for them to contribute by asking them to prepare a few thoughts on a specific agenda item in advance. Then, during the meeting, be sure to ask them for their input. This provides them more of an opportunity to share ideas (without being put on the spot) and prevents them from feeling intimidated into silence by more assertive coworkers. It can take great effort for a shy person to speak up; they’re also likely to struggle with the negative self-talk described above. Help counteract this negative talk – and encourage contribution – by offering praise whenever they share ideas. You can also acknowledge their other strengths in the workplace. For example, consider saying, “That’s a great point; thanks for sharing,” when a shy person speaks up in a meeting. Or make a point of letting them know you value their equable demeanor on the job. Since shy people often have trouble broadcasting their own accomplishments, it can also be helpful to emphasize their achievements to other team members so the shy person’s contributions get the recognition they deserve. Sometimes, a shy person’s demureness can be perceived as weakness by more aggressive coworkers, and this may lead to bullying or other behaviors that reinforce the shy person’s silence. Take the time to get to know your shy employees so you can gain insight into why they feel intimidated to speak up. If it’s because of other team members’ poor behavior, be sure to address the issue (behind closed doors) so it doesn’t get worse. While your efforts to encourage shy team members’ contributions are laudable, it’s also important that you don’t push their comfort zones too far. A shy employee may not want to be in charge of sharing bad news with a higher-up or delivering an important presentation, and that’s okay. Allow employees to set healthy boundaries and grow at their own pace, and you’re more likely to cultivate a team that’s willing to stick around for the long haul. If you’re a shy person and you’ve tried the strategies on this list but still don’t feel any better, it may be time to talk with a therapist. They can help you identify any root causes or triggers that contribute to your shyness, determine whether you struggle with social anxiety disorder, and provide you with more tools to address shyness at work. No matter what, don’t be too hard on yourself – it takes all kinds of people to make the world hum, and there’s absolutely no shame in being shy.